Diploma in Environmental health and safety Engineering is a specially designed education programme covering comprehensive Safety Management concerning industries which are dealing with hazardous materials and chemicals that can cause harm to environment and employees’ health. This tailor-made training programme developed by Green World Group addresses environmental safety and occupational health for employees. The one-year diploma programme is developed for those who have awareness and interest in occupational Environmental Safety Management. The course educates participants about the relevant functions and responsibilities of a safety expert in the working environments involving hazardous wastes, chemicals and other harmful substances which can pollute the immediate environment and cause health problems for people. The course also delves with the latest know-how and development in the field of environment engineering and hazardous waste disposal systems. Diploma in Environmental health and safety course teaches student on various environmental norms and standards apart from educating them on safety and health management and necessary safety procedures. On completion of the course, candidates can practice as independent safety experts or employed in safety department of any industry set ups. They will have deep understanding on general safety standards and procedure along with latest know-how on health and safety issues associated with work environments. Students will have to clear four theory papers along with one practical exam assessed by a panel of safety and health experts. Candidates appearing for the paper 1 and paper 2 of the written exams will have to attend 10 compulsory questions within two hours. All questions carry equal marks and the total marks for each paper is 100. Similarly, for paper 3 and paper 4, students will have to answer 10 questions carrying equal marks. 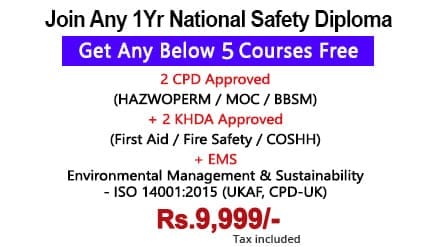 Are there any seminars for Diploma in Environmental Safety ? We do offer a twelve-day non-compulsory seminar for students with an extra fee. The seminar will be conducted at GWG Business Center in Chennai, India. However, the seminar will be conducted only with we have minimum number of students enrolled for it. Students can also contact tutors to clarify any doubts in the subjects through either e-mail or phone. Will the course material be provided? All the relevant course materials are indigenously made by a panel of experts. These study materisls and other supporting documents will be made available to students. The course materials are also approved by the government of India. What are the certifications I will get after completing the tests and when will I get them? Students will be issued certificates within a month from the announcement of results. The certificates and mark lists are provided by Central Board of Examination and National Development agency, Government of India. Additional certifications will be given for candidates securing distinction and first class. What is the Fee Structure for Diploma in Environmental Safety ? The course fee for Diploma in Environmental health and safety includes exam fee, administration fee and relevant study materials.